For the first half of the twentieth century, Brantford was an important industrial town and was once the third largest city in Ontario, and the railroad hub of Southern Ontario. I have a special place in my heart for this city as it was my first home when we emigrated to Canada in 1977, and I thought it was a beautiful here. This is where we made our first Canadian friends, and this is where we spent our first Canadian Christmas. The beautiful Grand River is navigable this far up-river, and the accessibility by rail and river helped this city grow from being a Farming community into an industrial city, and contributed to it’s growth in the twentieth century. In the 1980’s and 1990’s Brantford experienced a decline due to the bankruptcies of several large manufacturers such as White Farm Equipment, Massey Fergusson, Harding Carpet and Koering Waterous which left thousands of people unemployed. After a period of economic depression things have improved and this city seems to be undergoing a economic revival. If you are visiting this area, try to visit the Bell Homestead which was once the home of Alexander Graham Bell, inventor of the telephone; the homestead is a museum worth seeing. This is a National Historic Site and has been restored to appear as it was in Alexander’s day. Inside the Visitor's Centre you can watch the short, but interesting, video about the life of Bell and then enjoy a guided tour of the House, lead by a Guide in costume from the turn of the century. You will find the Bell Homestead at 94 Tutela Heights Road, and you can call 519-756-6220 for information. The admission is reasonable at $5 for adults and $3.75 for children and seniors. Little ones under the age of 6 are free, so you can’t beat that! On the Homestead property, there ample parking and a Tea-Room inside the Visitor's Centre, where you can have Afternoon Tea served in surroundings reminiscent of Victorian times - we had Tea and Tea-biscuits (a little like scones) and they were delicious! 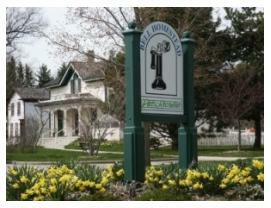 Hockey fans will know that "The Great One", Wayne Gretzky , was born and raised in this community. Although I have never had the pleasure of seeing Gretzky play, I do know that his home town is justifiably proud of this fabulous player and coach, who is considered by many to be the best hockey player ever to put on skates! He was coached by his father during his early years and signed his first professional contract at the age of 18. 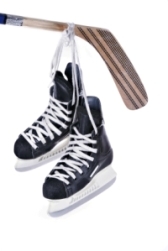 In the years following, he excelled at hockey, winning four Stanley Cup championships, triggering the popularity of hockey in the western U.S.A, and played in the Olympics. He also set 61 N.H.L. records in his 20-year career. Gretzky was inducted into the N.H.L. Hall of Fame in 2000. Brantford was first settled in 1784 by a group of Six Nations Indians, led by Chief Joseph Brant , who left Upper New York state to settle in Canada. They were given a tract of land on the Grand River in gratitude for their loyalty to the Crown and the settlement was named after Joseph Brant. One historic site that my hubby and I always visit when we are in the city, is Her Majesty’s Chapel of the Mohawks on Mohawk Street, on the outskirts of Brantford. 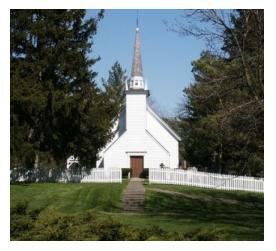 This was the first Protestant Church built in Ontario, and the First Royal Chapel to belong to Native People. It is such a spiritual and restful place and it is calming to roam the peaceful graveyard which surrounds the chapel. Telephone (519) 756-0240 for information. Actually, the Chapel has romantic associations for us as this is where my hubby "popped the question" to me in 1994, so it will always have lovely memories for me. We were two middle-aged, widowed people at the time and little did we know how our lives were going to change - check out our About Us section. Near the Chapel you can access the over 40 km of Nature Trails, which includes an all-season stretch of the Trans-Canada Trail. This trail system connects to the cities of Cambridge and Hamilton and is great for hikers, cyclists and anyone who enjoys the outdoors. 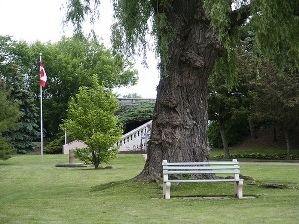 Brantford was the birthplace and home of Canadian Native Poet, Emily Pauline Johnson and her home, Chiefswood, is now a National Historic Site. Check the Museum website for hours of opening. Admission is $5 for adults, $4 for students, Seniors and children under 12 years of age are free, which is a great bargain for an information filled outing! Located south of Brantford on highway 54, this would be a great place to take the grandchildren in the summer. The City of Brantford is host to some of the longest-running festivals in Canada and each summer hosts the "International Villages Festival" which is a local celebration of various countries and cultures from around the world, and has been a tradition for over 30 years. Brantford is home to the Canadian Military Heritage Museum and the Vintage Motorcycle Museum, both are located at 794 Colbourne St and you can call (519) 759-1313 for info. Here you will discover Canada’s military history, from the United Empire Loyalists of the 1700’s, to the peace keepers of today. Motorcycle enthusiasts will enjoy the Motorcycle Museum which is also on the site. On Fridays and Saturdays there is a Farmers Market in the downtown area, on Icomm Drive, between 9 am and 5pm on Fridays, and 7am and 2pm on Saturdays. 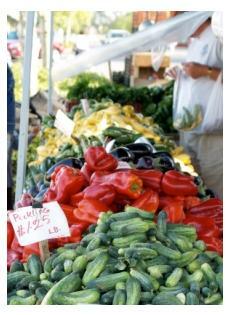 Come and check out the fresh, local produce. Earl Haig Family Fun Park is an adventure for families and children of all ages and has a variety of water attractions including a new spray pad, go-karts, batting cages, mini putt, and play. Here you can host a family reunion complete with a mini-golf tournament, or organize a company picnic - Earl Haig Family Fun Park is a great place for whatever your plans! For the families out there who enjoy loud car races (my hubby and sons do!) then you'll love a day out at the Ohsweken Speedway which is located to the south of Brantford, check out their website for times of races and the location of the Speedway. For your next Church or Social Club outing, take a look at the site of the Grand River Cruises Located between Brantford and Caledonia, these cruises are great for a group of people for a special occasion. My mother took one of these cruises a couple of years ago when she was over here from England and she had a wonderful time - it was the highlight of her trip! If you are looking for a unique Bed & Breakfast experience in the Brantford area, check out the River Ridge B & B in lovely Paris, Ontario, where your hosts Cathy & Paul Dawson, welcome you into their river side home.